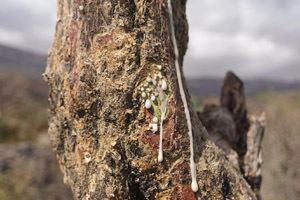 Frankincense essential oil is obtained from the hardened oleo-gum resin collected from Boswellia carterii or related species found in the Boswellia family. 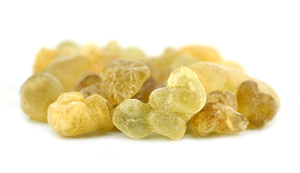 The genus Boswellia comprises of approximately 23 species, but only about 6 of these exude oleo-gum resin that yields frankincense oil with the beautiful, classical fragrance we are familiar with. Other resin bearing species include; B. sacra, B. thurifera, B. frereana, B. neglecta and B. serrata, – each one producing a frankincnese essential oil with a slightly different aroma. The nature of Boswellia trees makes them difficult to identify because they are leafless and in a drought-dormant condition for part of the year, so it is not uncommon for species to be misidentified. From the Burseraceae family, Boswellia carterii is a small tree or shrub that grows up to 5 metres in height. It is a slightly bizarre looking, but strangely attractive tree that has no central trunk, but instead presents twisted, gnarly, angular branches that emerge just above ground level. Abundant serrated pinnate leaves appear on the branches in pairs of ten, and the small five-petalled flowers are pale yellow or white. The oleo-gum resin is located in vertical reservoirs within the bark of the sturdy branches. 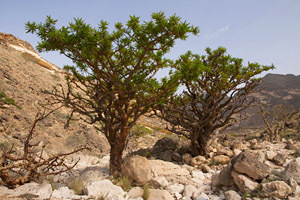 Trees found on the Somali coast grow out of the barren marble-like rocks to which they are attached by a thickish mass resembling a mixture of lime and mortar. The young trees yield the most valuable gum whilst the older ones yield only a clear glutinous fluid. The use of frankincense resin was recorded over 3,000 years ago, and by 1,000 B.C. Arabia had become the centre of the ‘Spice Trade Route’, where precious aromatics and herbs were traded. Vast trading empires were built upon this route, and cardamon, coriander, cinnamon, cloves, cumin, garlic, myrrh, nutmeg, sandalwood and valerian were bought, sold and transported. 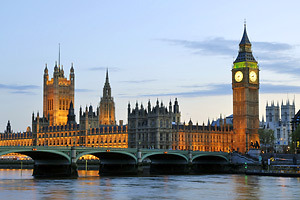 However, it was the revenue from frankincense that brought the most wealth to the region, mainly due to its heavy use as an ingredient of ceremonial incense which was used by many religions. Such was the wealth created in the trading of frankincense, that at one time the Arabs were required to pay a tithe (a tax amounting to 10 percent) to the Persian King Darius. In the bible it describes how the three wise men transported gifts of gold, frankincense and myrrh to the baby Jesus shortly after his birth. For many people, it seems almost inconceivable that frankincense and myrrh resins were considered as precious and costly as gold at that time. But they really were. 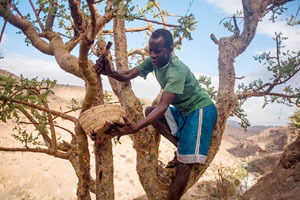 The origin of frankincense was kept a closely-guarded secret by crafty Arab traders, and since it was originally obtained from limited geographic regions the demand for the resin far exceeded the trees ability to provide. Add to that the difficulty involved with transporting and delivering this precious cargo you can begin to understand why this became such a lucrative market. Today, frankincense essential oil is mainly produced in North-east Africa, Arabian peninsula, China, Ethiopia, India and Somalia. 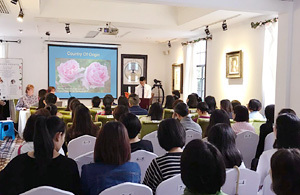 Although Indian and Chinese frankincense oils are commonly supplied to the unsuspecting aromatherapy market due to their cheaper price, the fragrance and therapeutic properties of these oils are inferior to those from Somalia, Yemen and Oman. To collect the resin, workers make longitudinal incisions in the bark of the tree, and below these incisions a narrow strip of bark about 10 cm in length is peeled off. One month later, and again a month after that, deeper incisions are made in the same place as the first cuts. This causes the tree to exude a white milk-like emulsion, which after a time congeals into yellowish tears and drops. These are known as the ‘tears of frankincense’, or ‘tears of olibanum’ – which is the name they are known by in the aromatics industry. The tears are picked up from the ground or plucked off the bark. The gum is collected all year round except in the monsoon period which is mid June to mid September, when the workers are busy with other agricultural work. The tears vary in size from one eighth to one inch in diameter and are graded according to size and quality before distillation. The constituents of the gum oleo-resin can be obtained either by steam distillation, or solvent extraction followed by steam distillation. Frankincense essential oil is a pale straw colour, and has a fresh, warm and balsamic odour with a hint of lemon or orange citrus, depending upon species. Frankincense essential oil is quite versatile and can be used in massage to treat a wide range of conditions such as acne, cystitis, dermatitis, dysmenorrhoea, eczema, immuno-deficiencies, and rheumatism. All types of respiratory conditions respond well to this oil, and when used in a diffuser or burner it is excellent for asthma, bronchial conditions, coughs and colds. Likewise, its ability to calm a troubled mind is virtually unsurpassed, which is why the resin has been used for thousands of years in meditation and prayer. It is the perfect essential oil for reducing anxiety, claustrophobia, fear, frustration, depression, hysteria, impatience, insomnia, panic, restlessness, shock, stress and general worries. The skin cell rejuvenating powers of frankincense essential oil are legendary, making it indispensable in skincare for treating fine lines, wrinkles and scars. Likewise, it is the perfect oil for reducing stretch-marks, especially when blended with neroli, lavender, rose and other rejuvenating essential oils. 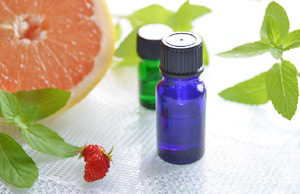 Frankincense essential oils blends nicely with virtually all oils since it is almost a perfume within itself, but works particularly well with benzoin, bergamot, lavender, lime, myrrh, pine, orange, bergamot and lemon, sandalwood. The temple of Amon has records dated 1,200 years before the birth of Christ that describe deliveries of frankincense totalling 2,159 jars and 304,093 measures in a single year. Herodotus wrote that 1000 talents in weight of frankincense was offered every year on the altar of the great temple in Babylon during the feast of Bel. "Control of the frankincense trade has made the south Arabians the richest people on earth!" Pliny was absolutely right, and frankincense gum-resin remained lucrative to the Arab traders for at least another thousand years. Centre: Oleo-resin oozes from a wounded tree prior to harvesing. Above: The dried resin after harvesting, ready for grading.